It’s challenging to find the perfect home—one that’s in a good neighborhood, offers enough space, and has the right design. According to FiveThirtyEight, a subsidiary of ABC News, the average American moves 11.4 times in their lives. So, why add another transition when you can get it right the first time? After all, we spend approximately 68.7% of our time in our homes, according to the U.S. National Human Activity Pattern Survey. This can make tolerating minor inconveniences feel like you’re battling major annoyances. However, even building a home can come with its own set of challenges. Financing can be difficult to obtain, inexperienced builders miss deadlines, and the design process can be stressful. But it doesn’t have to be that way. If you align with the right building team, the whole process can actually be enjoyable. From laying the foundation to dropping the keys in your hand, you want to find a company that provides support and market insights, understands how to turn your vision into an actionable design, and maintains a strict time frame. 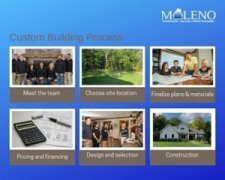 To learn more about the phrases of new-construction, let’s explore how Maleno streamlined their new construction process. In the initial meeting, Maleno reviews the basic specifications of your desired home, such as the square footage, number of bedrooms, and garage size. You can even take a virtual tourof past projects to see their customization options in the context of a completed home. After determining a home site location, Maleno dives into your style preferences and floor plan. Simply let them know if you’re using one of their blueprints or one of your own and they’ll review the floor plan options and details as well as all products and features of your new home. An experienced building team will offer support even during the financing process. “Once we have the floor plans and pricing situated, the customer is ready to go to the bank and apply for a new construction loan,” Maleno notes. During this phase, homebuyers and lenders will discuss possible loan terms and financing options. To help you secure financing, Maleno will provide a clear-cut timeline for your lender and stay in communication with them during the entire process. It’s important to pick a builder that is confident in the material they use as well as the quality of their workforce. For instance, to confirm “tight” craftsmanship, Maleno hires a third-party energy auditor to perform a blower door test to determine a home’s airtightness and to locate any possible air leaks. Auditors also inspect for moisture and condensation, as well as various safety requirements. The U.S. Energy Information Administration states that about 42% of the energy used within a home is dedicated to heating. One component of Maleno’s energy-efficient package includes foam insulation from Demilec, which, along with high-quality windows, will keep your heating costs low. To potentially add additional value to the home, they also use Superior Walls products when laying foundations as the material is incredibly durable, energy-efficient, moisture-minimizing, and environmentally-friendly. Whether it’s the paint on the walls or the hardwood on the floors, every aspect of a house helps it feel more like home. And with that thought in mind, Maleno centralized their Design Center so that determining products, amenities, and energy-efficient options can take place all under one roof. As a homebuyer, it’s essential that you’re kept in the loop during the entire process (and even after completion). Ask your builder about how they schedule follow-ups and communicate with your lender. “We ensure a representative is working with the homebuyer throughout the entire process,” states Maleno. The construction process starts with laying the foundation, framing in the house, and then adding the façade. From here, Maleno works on wiring and plumbing. Generally, it’s around this time that lenders and homebuyers take a walk-through so that they can be informed of the intricacies of the home. After the building process is complete, Maleno accompanies you on a final walk-through to assure that your new home meets—and exceeds—your expectations. By following a streamlined process, the construction of the new home can be completed within 15 weeks. After you’ve moved into your brand new home, Maleno will check in with you at the 30 day and one-year marks, to ensure everything in the house is working and running smoothly. “Homebuyers will get a quality home they can be proud of and enjoy the process as it’s built,” promises Maleno. 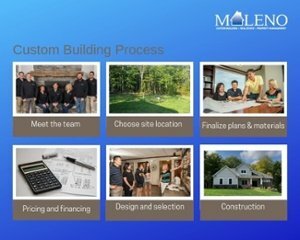 If you’re interested in building a new home, contact Maleno for a free consultation to see how they can help you build or find your dream home.